This beautiful sculpture of the Virgin Mary looks almost hand carved, but this plan shows you how to make it easily by simply cutting and stacking 1/2" and 3/4" pieces of wood or plywood. Easy paint pattern too! Project can double as a bird feeder if desired. 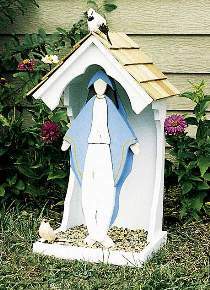 Plan includes FULL SIZE patterns for Madonna and shelter as pictured. Measures 14"W x 13"D x 28"H.